If you need something that is both affordable and durable to help show off your products, look no further than this White Wire Grid Panel! The sleek white finish will surely match nearly any setting and will help to sell your merchandise in style. 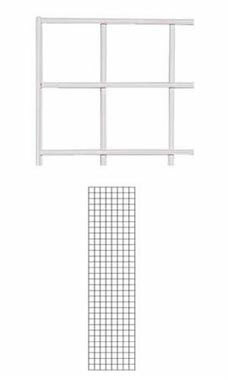 Measuring at 2' x 8', the Grid Panel is great for any size products an can accompany any of our Gridwall accessories, also carried here at Store Supply Warehouse. Featuring sturdy wires spaced 3" in the middle, and complete with double width wires along the outside of each panel, this piece is strong and reliable. In stock and available for immediate shipment. We used the 6' white panels, one mounted and one free standing. The options with display hardware allow us to change out our displays easily. We plan to order more.